The old myths and stories tell us that words and stories, memories and dreams, and the rocks, flesh, and sap of the earth, are bound up together. Maintaining these ties is the central human task. If they break, or worse, we cut ourselves loose from them, humans will no longer have identity, purpose, or place. Unfortunately, these are broken times, violent times of chaos, suppressed grief, and forgetting. Deranged is an extended meditation on the conscious experience of collective fragmentation and the power of memory to heal it. This meditation takes the form of three overlapping stories. In the first, titled “Reckoning,” Anna tries to bury an urn of ashes that won’t stay buried. This is followed by “The Looking Back Woman of Scantic Gap, ” which traces the dialogue between the living past, held by the elderly Sophia in service to home land and ancestors, and the cyclical movements of the natural world. In the final story, “The Taxidermist’s Daughter,” a young girl named Louise tries, for a while, to satisfy her father’s longing for a son and learns his bloody trade. A number of themes bounce and echo in the space of Jamieson’s stories: the bonds between father and daughter, or mother and daughter, the power of grief, the search for redemption, sacrifice, and how a thing is remembered or forgotten. “Some are driven insane by the attempt to forget, and some seem insane trying to remember” she writes. According to Jamieson, the madness implicit in forgetting is a poison we can stop making and spreading if we are willing to bear our guilt and grief. But the insanity (or derangement) of remembrance may not be a choice. Memory is a palpable force and active agent in these stories. Individuals are born to “carry the holy longing” of the dead. The crucial task of remembering that Jamieson explores falls largely to women, women who are still living a life in regular contact with a deep sense of home, home as in homestead, a place where families have lived for many decades if not centuries, where the trees are as familiar to them as the bowls in the kitchen. This embodied connection to place and rooted memory is increasingly rare but Deranged creates a longing for it, and an appreciation for those individuals, fictional and otherwise, who remember for all of us. 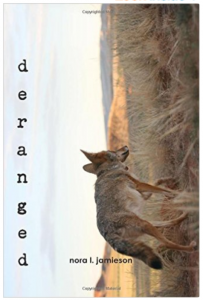 Deranged is a book that works on the permeable soul of the reader. I occasionally got tangled up in Jamieson’s word strings or felt buried by her densely packed images. The details of water, food, fire, hands, and blood were a thicket that I needed to beat my way through, like the undergrowth in the pine forests where her characters reside. Later, I realized that this immersion in sensory detail is part of the book’s power. Like seeds dropped into the damp soil, they sent down roots in my psyche, encouraging me to consider the choices that I am making, the memories I refuse to carry. Jamieson, Nora L. (2015) of Deranged. Weeping Coyote Press. Catherine Svehla, Ph.D. is an independent myth scholar, storyteller, and artist. She is the founder of Mythic Mojo, where she creates story-based classes and programs that demonstrate the relevance of mythology to contemporary life, and the host of Myth in the Mojave, a weekly online radio show that airs on Radio Free Joshua Tree and reaches an international audience. Visit www.mythicmojo.com and www.mythinthemojave.com and find Myth in the Mojave on Facebook.